Rabbit anti Pig erythropoietin antibody recognizes erythropoietin, a secreted protein belonging to the EPO/TPO family and also known as EPO or hematopoietin. Erythropoietin is a hormone secreted in adult mammals primarily from the kidney, and to a lesser extent the liver. In the fetus, EPO is secreted from the liver. EPO functions as a regulatory cytokine in the differentiation of erythrocytes. Antisera to pig erythropoietin were raised by repeated immunisation of rabbits with highly purified antigen. Purified IgG was prepared from whole serum by affinity chromatography. This product may be used as a capture antibody in a sandwich ELISA together with AHP2389B as the detection reagent. 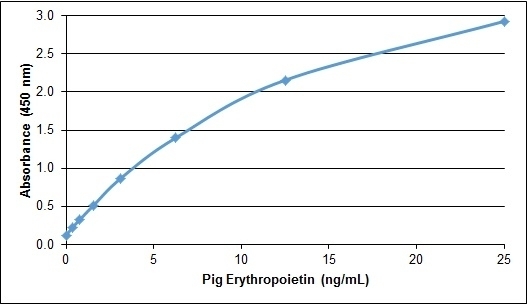 Recombinant Pig erythropoietin (PPP021) may be used as a standard. David, R.B. et al. (2001) The porcine erythropoietin gene: cDNA sequence, genomic sequence and expression analyses in piglets. Domest Anim Endocrinol. 20 (2): 137-47.